These are certified hosts of the FBI Entertainment Unit. This badge grants rights to the FBI Events room. This badge is given to the former workers of FBI New York (2011 to 2016) owned by eriol, Olorin and DjBabySky. Thanks for the memories! The Headquarters of the Russian Tsardom! The Great Invasion Army of the Mighty Tsardom! HAIL Tsardom! quit lol bye this is a spare group. View what state the totem needs, in order to get the effect. If you mess with us, we'll nuke you with our top secret mushroom cloud. You just got Rekted!.. Request This badge at your Risk, All who got in Rekted. This is a special badge that is given to those intrusted with day to day opperations. This is a special assignment and each director has a responsibility to fulfill according to their title. 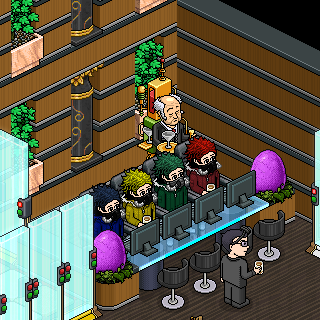 Habbo SVR is responsible for ‡‡‡‡ ‡‡‡‡‡ ‡‡‡ ‡‡‡‡roleplay ‡‡‡‡‡ ‡‡‡‡‡ ‡‡ ‡ fun ‡‡‡‡‡‡‡‡ Glory To Russia! People with this badge are allowed to wear regular clothes while working. these people are allowed to promote. These people are intrused with letting people into the base. People with this badge are responsable for training members. This is the highest civilian division rank a member can attain within the Russian Federation. This badge is equivalent to owners. This badge is for people who have helped the cause and contributed with a generous donation. This is equivalent to Founders of the Russian Federation. People with this badge are to be treated with respect while in our base. Cashews, almonds, walnuts, and peanuts. Cost :20c Only Win Half The Prize! Percentage on purple sticker! Been a great time. Legendary times. Unused telephrase. Don't bother looking. Room Full. Max: 1 Sorry. Get ready to enter this colorful Carnival & Mardi Gras-themed Room! Taken in this room on 15 March 2018 and received 2 likes. Taken in this room on 4 March 2018 and received 1 likes. Taken in this room on 30 August 2015 and received 0 likes.